It’s an inferno that’s raging out of control, and it’s up to you to distinguish the flames. Click here to play! Put out the fire on these reels and you could pick up some big money payouts. It’s the sevens that are setting this traditional 3 reel game alight. Spin in these symbols to help put out the flames. Triple flaming lucky 7 are the hottest symbol in this game. Spin three of them across the single payline to win the progressive jackpot. Three yellow flame 7s hold a top payout worth 2,500 coins. Next up are blue hot 7s. Three of these will get you up to 1,000 coins. Finally, three red hot sevens will get a top payout of 500 coins. There are a few other symbols adorning these reels that will help you in your quest to extinguish the flames. Thee include watermelons, bells, cherries, plums, lemons, and stars. 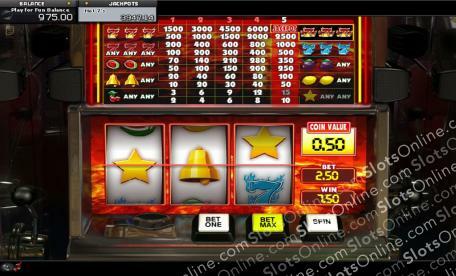 This traditional 3 reel online slot offers a coin wagering system. With each coin you bet, the higher the payouts will be. Be sure to wager the maximum of five coins to activate the highest pay table and be eligible to win the progressive jackpot. See if you can spin the reels on this hot 3 reel slot to control the hot 7s inferno and you could pick up some very generous payouts.